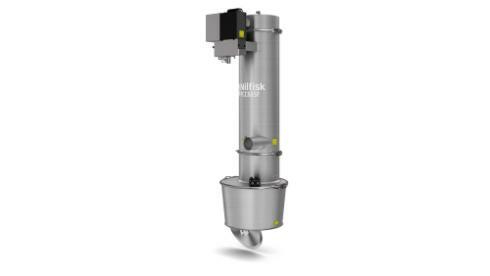 The Nilfisk PCC66SF is the innovative pneumatic conveyor , conceived to be integrated into the process of food industry. With its capability of conveying, up to 3100* kg/h, the conveyor is suitable for large amount of food material as for example coffee grains and corn or in general for all materials requiring very good hygienic level. The special filtering system and high performance in cleaning, ensure the highest filtration performance and high durability of filter. The PCC66SF is available with or without control system, can be fully integrated in the process machine or can be used with its control system as fully independent conveyor. The PCC66SF line has been designed to be conform to FDA and 1935/2004, available also with ATEX certification. The conveyor Is fully GMP, each part can be easy disassembled without tools. COAX® technology with 3-stage COAX® ejector is higly efficient, 30–50% more energy efficient than single stage ejectors, improves the performance with modular concept, pump size is determined by number of cartridges. Thanks to 3-stage cartridges, the PCCxxSF line is higly flexible, capable to convey, with best performances, different material of different granulometry and different specific weight.